It was a very busy week! I worked for four days and then on Saturday my partner and I went over to Vancouver Island for my niece's 40th birthday celebration. We left the house at 7:30 AM and got home around 11:00 PM. Unfortunately the light from the extended days means I am waking up around 6 every morning whether I need to or not. I'm tired. Then today was a huge event since it was my daughter-in-laws' first Mothers Day! Both of the babies are crawling all over the house and doing their best to walk around the furniture. In one month they will be a year old! I almost decided not to post and go to bed early instead, but on Thursday I'm heading off for my annual long weekend with some women friends and I won't be posting anything next weekend. I'm not sure I'll even have time for reading. 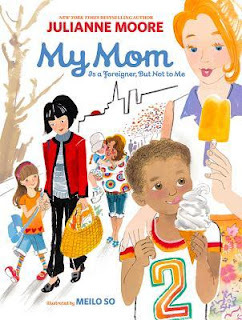 The idea of this book, that mothers are not all the same, is a good one. The problem for me is that it took me a while to figure out that this is not really one person narrating, but one narrator speaking for many. This is confusing. The best part for the grade one students I read it to, was trying to figure out what picture went with what holiday. This book gave me shivers. Jacqueline Woodson tells the story of roots that reach back into the days of slavery. It's a heartbreaking tale that tells of seven year old children being ripped from their mother's arms and sold. It shows the important meanings in the different patterns in patchwork quilts with regards to the underground railroad, and how this knowledge was an integral part of their reality. When the quilts were no longer needed to escape slavery, the women's sewing skills raised money to help their families have better lives. Hudson Talbott's illustrations are stunning. 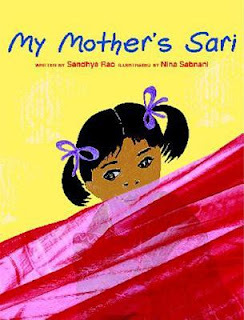 This is a beautifully illustrated book that tells the reader everything that makes a sari fabulous for children. I liked that the end papers have directions for how to wear one. What distracted me is that I anticipated the story would be from one child's perspective, but the images show different kids interacting with it in different ways. The problem with this kind of portrayal is that as a reader, there isn't one character to connect with. Jaime Kim's illustrations are what make this book for me. Otherwise, it took me a bit to figure out what was going on. Eventually I understood that this is a book about loneliness and finding a special friend to share your song with. The illustrations really make this book. Otherwise, it was ok. I like the idea of some strange fey creature living in the woods. That what she was seeking was a bedtime story was kind of sad. Unfortunately the rhyming scheme didn't work for me. I’m not sure if I expected more from this book because of the hype, or if I’m just into too much of a political headspace these days. But this book bothers me. Perhaps it's just too twisted for me. The art in this one nearly made me swoon. 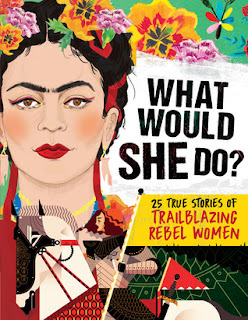 I read this to groups of grade 3/4 students this week and am happy that the only thing that made a few of the boys uncomfortable was seeing Julián in his underwear. We have come a very long way since I first started teaching. This book just gobsmacked me. I didn't plan on picking up more than one book while at the book store, but I fell deeply madly in love with this. It is visually and lyrically stunning. It begins with a sandpiper taking off from the beach. Its journey takes it across the earth where it flies over all kinds of horrific scenes. Along the way it looses a few feathers that bring comfort to those who find them. Eventually the bird arrives at its winter nesting grounds, thankful to be safe. In many ways this book was delightful. The writing is beautiful and filled with numerous important truths about what it means to be human. 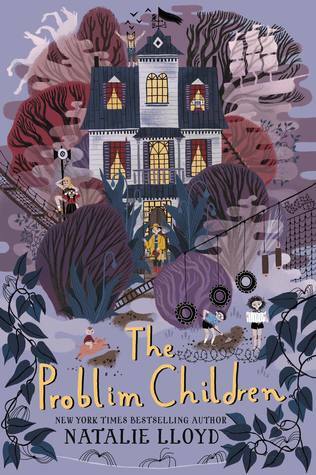 There is a collection of interesting characters in the children and their adversaries. In spite of the littlest Problim’s communicating through farts, I liked it a lot. It was when I realized that it wasn’t going to end with a satisfying conclusion that I became upset. I hate it when the main problem, in this case the uncovering of the family treasure, isn’t resolved by the end of the book! Grrr. This book looks at a number of important women from across time and space. Its layout is interesting because of how the information on each woman is formatted. On the first page is an image with a large print paragraph of basic information. The next page provides more in detail in much smaller font. Each section includes a question and answer component that links possible present day concerns with what the individual woman might do in the same situation. Each section ends with a quote from that individual. The art, created by numerous illustrators is brilliant. My only quibble with the book is that the small font is a grey colour and was difficult to read. I just couldn't read Scythe while listening to We Were Eight Years in Power: An American Tragedy by Ta-Nehisi Coates. An imaginary dystopian world just doesn't cut it when reading about the real life dystopian existence that so many people continue to live through. I read the end of Scythe just so I could let go of it. I've just started The Oceans Between Stars by Kevin Emerson. The Problim Children is very unique. I wonder how long we'll have to wait for the second to find out if that problem gets resolved. 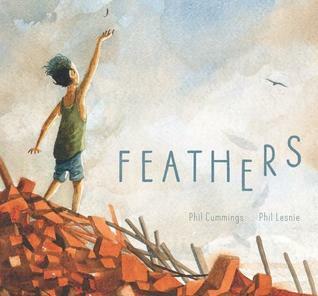 Feathers is not a book I know, but it sounds powerful. I love her writing, but am not a big fan of books that don't just leave me satisfied . Sheila Turnage's Three Times Lucky series is an example of one that does. Feathers is going to go places I think. I just put in a request to check out Show Way from our local library, so they'll deliver that probably later this week. I'm looking forward to reading Problim Children when we get it out here. 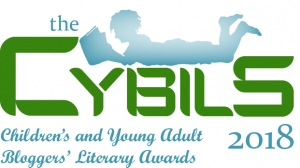 And I've added Feathers to my TBR list after seeing your review. Thank you for sharing, Cheriee! I'm impressed you made the time to read and write after all you've done this week. Have a great week! I'm going to be looking forward to reading your thoughts on Show Way! Thanks for your review of each one, Cheriee. I hope you have a great time with your friends this weekend! You are welcome! I plan too. 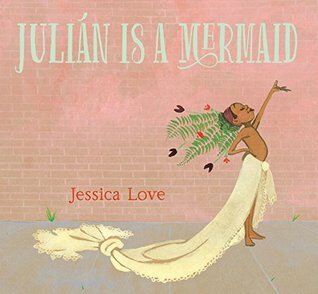 Julián Is a Mermaid is on my wishlist! Saw it at the bookstore yesterday. My students loved The Wolf, the Duck, and the Mouse. Kid test it! I trust you so I will give it another chance! My Mom is a Foreigner...sounds so cute! Perfect Mother's Day book. I thought so too Angelica, until I tried to read it out loud and it didn't work! I'm looking forward to reading Show Way, as I'm a big fan of Jacqueline Woodson. Hope you have a wonderful weekend! I think this one is her most profound picture book! I have a few Woodson books to read as part of my TBR for this year. She's coming to Portland next year! That is fabulous Earl! I saw her when she was in Vancouver. I had similar problems with My Mom Is a Foreigner, But Not to Me. It's a great concept, but a tough book to read aloud. I think it was all the different characters and mothers. I agree that the idea is great but I'm not sure how the lack of connectivity could be fixed - perhaps by a more serial telling of the individual stories instead of jumbling them all up. I am super excited to read Julián. I've heard so many good things about it. I will also have to look for feathers. So many great books this week (Julian is a Mermaid made me swoon too!) and a few I added to my Goodreads to-read list. Thanks! How could those images not make you swoon? 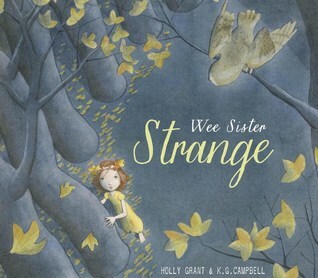 Completely agree with your comments for La La La and Wee Sister Strange. 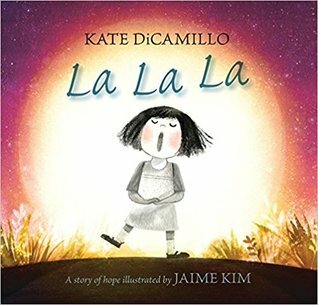 I ended up loving La La La, but it was completely through the illustrations. I am reading Julian is a Mermaid very soon to some kids. Will be interested in their reactions. I'll be looking forward to reading how it goes with Julian is a Mermaid. 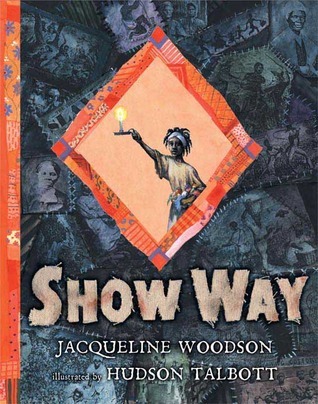 Show Way sounds very interesting and I love Jacquelin Woodson. Thanks for sharing! I am a huge fan of her work too. This one is a powerful book! There are so many wonderful titles here. 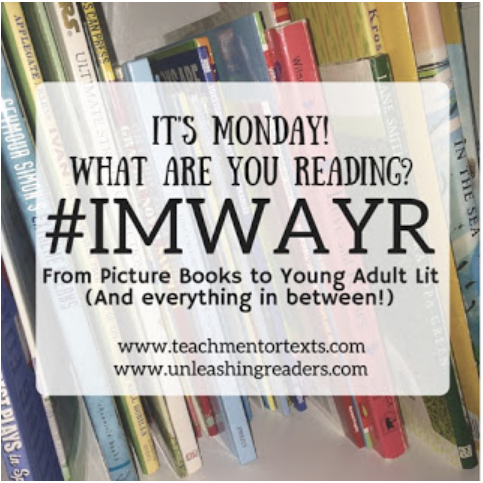 Show Way is one of my absolute faves and I always booktalk it during my first day of class for one of my higher degree courses. I've stacked Feathers on Goodreads - it looks exactly like something that I would fall in love with, as well as What Would She Do? 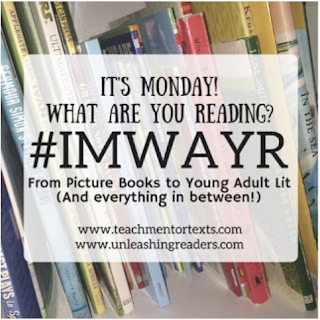 Amazing curation of reads this week! I thought of you when I read Feathers this week. I think you will love it! I appreciated all your reviews this week. 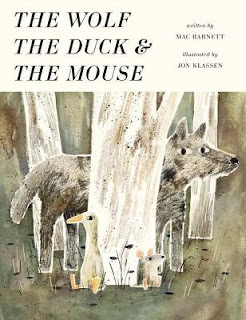 I haven't really thought of why I can't get into some picture books, and I think you are right that sometimes the words just do not connect, and I personally do not get as much out of pictures unless I really take my time. Thanks for the post. I have The Problim Child, but I am thinking I might wait until I see a second out as I have too many other books in the piles around my place. I know this problem of two many books all to well Aaron! I think waiting is a good idea because the story is delightful other than the ending. I love K.G. Campbell's work but "rhyming scheme" is always soooo off-putting to me. There are like three picture book authors who should be allowed to rhyme, and everyone else simply needs to STOP. I might peek at the illustrations if I see that one in the store, but I will have to skip the text. I have been wanting to read Julian Is a Mermaid for awhile now. I think I'll request that my library purchase it. I hate it when the rhyme and rhythm doesn't work. It's even worse when you are reading to 5 year olds who interrupt to tell you it doesn't work.